Three of the latest lens choices from Smith Optics. See how they influence vision in the image below. I used to wear cheap waders. I had a chronic case of sticker-shock that flared up every time I looked at the wader rack in the fly shop, and I’d flee back to the big-box store to buy a pair of $99 breathables, which replaced the $99 pair I’d just worn out. I realized one spring that instead of spending $100 per year on crummy waders, I could spend $400 every 4 years on a pair of quality name-brand waders. Once I did, I also found that they fit better, breathed better, and because of the investment I’d made—surprise—I took better care of them. Likewise, I’d always fished in $12 gas-station sunglasses. Why spend big bucks on a something I usually step on or lose? But after my wader-taught life-lesson, I saved my pennies and picked up a pair of Smith Optics glasses with glass copper-tinted lenses. 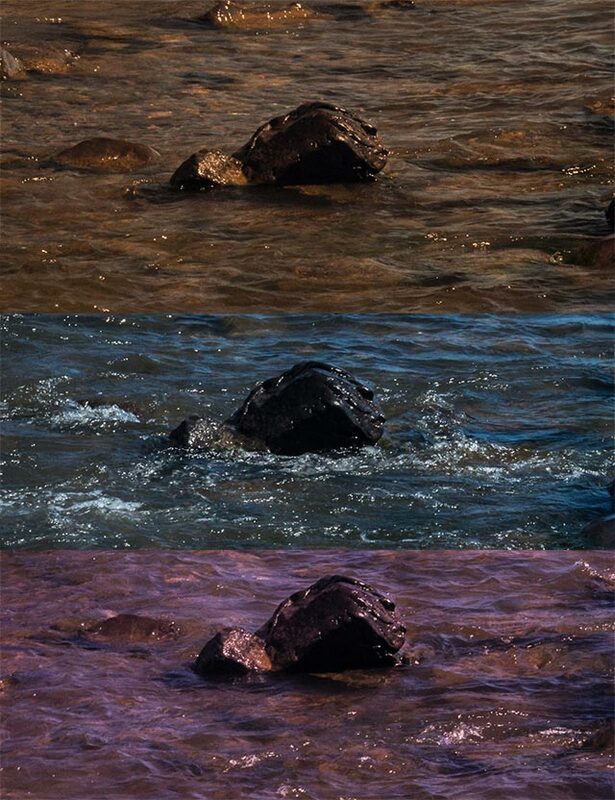 The difference on the river was startling. Surface glare vanished because of the quality polarizing; same for light leakage and reflection because of better fit and good optical coatings; my eyes didn’t have to struggle with flawed plastic lenses all day; and the increased contrast laid the riverbottom so clear in was almost unfair. I have a handful of other glasses now, in different colors, though I’ve never stepped on or lost my original Smiths. I also don’t wear them driving every day, to baseball games, or on my hat on nights out—and I always use the retainer strap they came with. Today, if I were to show up at the river having forgot my waders, I’d probably tough it out and wet-wade. But if I forgot my glasses, I’d drive home to get them. Sunglass lenses work by blocking a percentage of light from passing through the lens. Usually, they block most or all ultraviolet light (a major eye-health concern), and some smaller percentage of visible light. The percentage of total visible light that passes through the lens to your eye is measured as “Visible Light Transmission,” or VLT. Darker glasses have a low VLT, and lightly-tinted glasses have a high VLT. Lenses are generally made from either plastic or glass. Plastic lenses, usually polycarbonate, tend to be lighter and more impact-resistant. 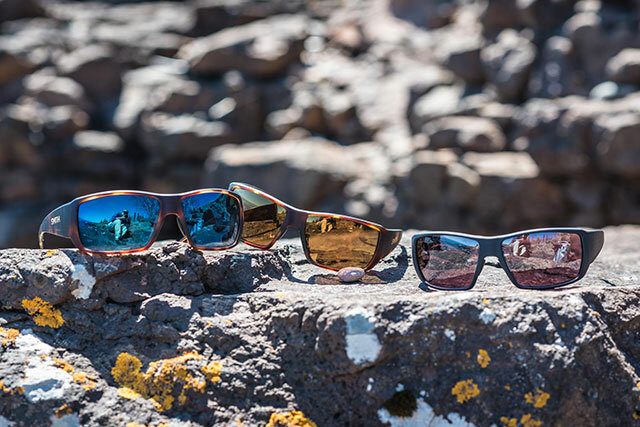 Glass lenses are optically clearer and more scratch-resistant—but they can shatter, so if you spend a lot of time casting flies with big hooks, lead eyes, or split shot, stick with the poly lenses for safety. With today’s quality poly lenses you’re not giving up much, if any, detectable clarity and they’re plenty scratch resistant if handled with reasonable care. Sunlight that reflects off shiny surfaces such as water tends to become polarized—its waves are oscillating in only a single plane. Polarizing filters on our glasses are then able filter out almost all the glare, improving visibility through the water’s surface and increasing overall contrast. The best way to illustrate this is to simply tilt your head sideways while wearing a pair of polarized glasses. As you approach 90 degrees off from the direction of the polarized filter, you’ll see the polarized glare reappear on road surfaces, windows, shiny cars, and most critically, the surface of the water. Any sunglasses you’re considering for fishing use must be polarized. Polarizing technology has been around a long time, but there are some recent developments in lenses that apply directly to the angler or other specialty user by filtering specific colors—wavelengths—of light to improve visibility under specific conditions. Smith Optics calls theirs ChromaPop. This lens coating filters wavelengths of light at the edges of the primary colors, where they overlap, increasing the definition between the colors you’re seeing, and increasing contrast—often dramatically. I’ve been using these for about a year now, from Lake Michigan to the Driftless to the Yucatan, and I won’t fish without them. You’ll see a mirrored finish on some lenses that helps fight glare, and reduces transmitted light by a few extra points. It also hides your eyes, so the fish (or that angler that’s outfishing you 2-to-1) can’t see where you’re looking. Note that the color of the mirror coating doesn’t affect the color of the transmitted light (or your vision)—the metallic blue or green look is just cosmetic. The base lens color is what really matters. Finally are the photochromic lenses, which darken and lighten on their own as light conditions change. This is a particularly handy feature for anglers, though I haven’t found it to be a game changer, and they’re often not quite dark enough mid-day or light enough early morning and late evening. There’s also a number of extra things that go into that high price tag that you don’t immediately think of, like coatings that are anti-reflective, anti-scratch, hydrophobic, and anti-UV. You will hear this across the optics industry—camera lenses, binoculars, riflescopes—and it’s no less true for sunglasses: you do really get what you pay for. Classic sunglasses have a grey tint, which filters all wavelengths (colors) of light at the same rate. The advantage is that the colors you see are accurate, since none are specifically filtered. But we fly anglers need a lens that filters specific colors to increase contrast, which helps shapes—like fish—stand out. Like anything, it’s about tradeoffs. For general fishing use, which depends more on your ability to see a riseform and general bottom structure than spotting specific fish, we benefit most from a versatile lens tint somewhere between yellow and red, which filter out the muddying blues and greens of our watery habitat. Most common are brown, copper, or bronze lenses with VLT ratings from 12-30%. Any of these offer excellent contrast under most conditions and filter plenty of light to reduce squinting during bright sun. If you’re after a more specialized tint for specific kinds of fishing, or as a secondary pair for early and late in the day, move toward either red or yellow—rose and amber—lenses with very high VLTs in the 20-40% range. You might feel more eye strain in bright conditions, but you’ll simply see more, and sometimes the high stakes of sight-fishing are worth it. For example, in his home range of the Florida Keys and Belize, flats jedi Captain Bruce Chard uses a bright yellow lens “all day, every day” for his clear-water, white-bottom flats fishing. On the other end is Captain John Mauser, who hunts redfish in the often-murky waters of inshore North Carolina. He recommends his clients bring rose-tinted glasses, and not just because he’s an optimist. Each major manufacturer offers a staggering variety of frame styles, and not all lens colors are available in all styles. Start at your local shop, and ignore lens colors at first—try on frames until you determine which ones fit your face. Each frame has a different size/fit, rather than each style being available in multiple sizes. When you’re spending this much money on glasses, it’s understandable that you want them to look good. But avoid trendy styles like aviators or any with square frame shapes that leave your periphery unprotected and allow glittery glare to leak in at the edge of your vision. Stick with frames that have large coverage, wrap your face, and have thick temples to block any sideways light but still allow some ventilation to avoid fogging. They should be lightweight, not touch your eyelashes, not pinch or hurt your nose or ears, and stay on your head at all angles. Once you know what size you need, filter those models by lens color. Ask the salesperson if you can step outside with a few colors to get a better sense of how they look and feel to your eyes. If you’re really lucky and there’s a river or pond near the shop, see which ones seem to best help you resolve details of the bottom. Keep in mind that the angle of the sun can impact how much glare exists and how well it can be filtered. Eventually, you’ll find a nice bite-sized selection of options—though the shop might not have them in stock. There are just so many possible combinations, and very few fly shops are able carry anything close to a full lineup. Resist the temptation to buy an on-hand pair of glasses in a frame or lens color that’s not exactly right. Instead, have the shop order the right ones in. You’ll be glad you did when you put them on and truly see your home water for the first time.